The 80’s Jewelry set is right out of the 1980’s! Set includes a black beaded necklace with a bright green triangle and a hot pink square pendent and a seat of matching pierced earrings. 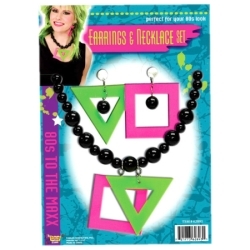 This jewelry set is perfect for completing any 80’s costume or as a fun set of costume jewelry.